We were coordinators of the EU*US eHealth Workforce Development Project under the Horizon 2020 program funded by the European Commission, which concluded May 2018. 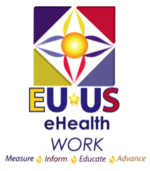 The overall goal of the EU*US eHealth Workforce Project is to measure, inform, educate and advance eHealth and health information technology skills, work and workforce development throughout Europe, the United States and globally. We will execute the tasks of measurement through an overall goal of mapping, quantifying and projecting the need, supply and demand for workforce skills and competences. We will inform new and incumbent eHealth workforce members, pertinent actors, stakeholders and others in the health information and technology field regarding the results of our measurements. We will educate by utilising results to build a set of foundational curricula, enhance the HITCOMP Tool and Repository, and build an interactive web platform usable by students, new and incumbent healthcare workers and practitioners, educators, governments and industry. We will advance the field of eHealth/health IT and further enhance workforce building initiatives by disseminating and exploiting the work generated under this project. We will utilise our "network of networks" in a perpetually evolving process of information, resource and tool development. This project has received funding from the European Union's Horizon 2020 research and innovation program under Grant Agreement No. 727552 EUUSEHEALTHWORK.